The pendency has led to an uncanny situation of the administrative side of the Court enjoying immunity from disclosure on account of delay by the judicial side. The recent Collegium decisions to elevate Justices Dinesh Maheshwari and Sanjiv Khanna to SC left many bewildered. The decision was in reversal of an earlier proposal made on December 12 to elevate Justices Pradeep Nandrajog and Rajendra Menon.The exact reasons for reversal remain unknown. There were also questions raised as to why Justice Khanna was chosen ignoring seniority of other judges, especially three other senior judges from Delhi HC, his parent court. The public and the legal fraternity have no means to know the reasons which led to these decisions. 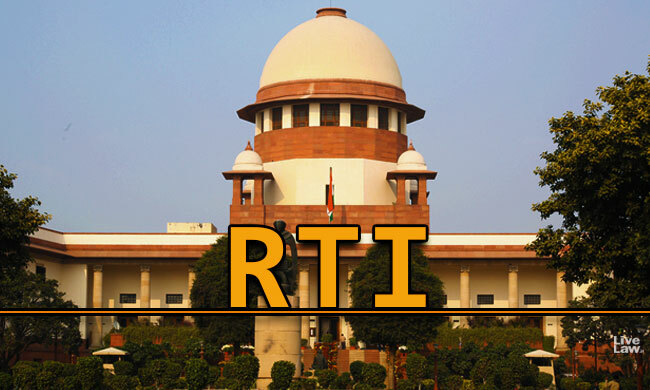 This latest controversy has brought to the fore another issue of seminal importance - the applicability of Right to Information Act(RTI Act) to the judiciary. The issue is remaining unresolved in appeals pending in the Supreme Court since 2010. On November 26, 20100, a Division Bench of Justices B. Sudershan Reddy and S S Nijjar had referred the matter to Constitution Bench, observing that the "questions involve the interpretation of the Constitution raise great and fundamental issues"
But no constitution bench has been formed yet to decide these issues. The issue arises out of an order passed by the Central Information Commission in 2009, directing the SC Registry to furnish information to Subhash Chandra Agarwal, who had sought information as to whether judges of SC and HC had given declaration of their income and assets to the Chief Justice of India. Jolted by the unexpected disclosure order from CIC, the SC administration rushed to the Delhi High Court, challenging it. The order was vehemently challenged before the Single Judge of the HC, with the Attorney General appearing for the SC. However, the single judge- Justice Ravindra Bhat- decided against the SC and upheld the order of the CIC in the judgment delivered on September 2, 2009. The judgment held that Supreme Court and the Chief Justice of India were "public authorities" under the RTI Act, having statutory duty to furnish information sought by citizens regarding the functioning and administration of the SC. While upholding the CIC order, Justice Bhat rejected the argument that information of judges' assets was exempt under Section 8(1)(e) of the Act as it was received by CJI under "fiduciary capacity". The judgment also held that the information of judges' assets does not qualify as "personal information" exempt under Section 8(1)(j). Though the judgment offered a bizarre optics of Supreme Court suffering a setback from the High Court, it was widely welcomed as a right step in the direction to enhance transparency in judiciary. The Supreme Court challenged the single judge's judgment by filing appeal before the Division Bench. Before filing the appeal, the SC had decided to voluntarily disclose information regarding assets and income of judges, by publishing it in the official website. However, the appeal was pressed by the Attorney General, saying that the dictum that SC was amenable to RTI Act was unsustainable. The SC suffered yet another set back, as the judgment of the single judge was upheld by a three member bench of the then Chief Justice A P Shah, Justice Vikramjeet Sen(later elevated to SC) and S Muralidhar on January 12, 2010. Meanwhile, the CIC allowed on November 24, 2009 another application filed by Agarwal, which sought file-notings in respect of appointments of Justices H L Dattu, A K Ganguly and R M Lodha to the Supreme Court. The sight of RTI Act catching up with collegium resolutions might have been unnerving to the SC, as it immediately challenged the decisions of Delhi High Court and CIC before the SC in appeals filed through Secretary General of the Court. The appeals were admitted, and the directions of CIC and Delhi High Court were stayed. Later, the matter happened to be referred to the Constitution Bench, as stated above. After the reference order passed in November 2010, the matter came up before bench on multiple occasions, but nothing substantial happened. On August 17, 2016 it was listed before a bench of Justice Ranjan Gogoi(as he was then), P.C Pant and A.M Khanwilkar. The counsel for the petitioner Prashant Bhushan made a fervent attempt to persuade the bench that here was no requirement for a constitution bench to hear the matter, as the issue stood covered by a seven judges bench in S.P Gupta case. Relying on paragraphs 83, 84 and 85 of the judgment, he advanced that the SP Gupta case had recognized the principles of openness and transparency in judiciary. According to Bhushan, the dictum in S P Gupta case sealed the issue, rendering a determination by constitution bench unnecessary. However, the three-judges bench headed by Justice Gogoi was not to be persuaded by Bhushan. Agreeing with the two-member bench, the three-member bench too expressed that the matter needed resolution by a Constitution Bench. The bench also noted the anxiety expressed by Bhushan regarding the "long pendency of the matters", and granted him liberty to make a mention before the CJI regarding it. After that, the matter has not got any listing so far, as discernible from SC records. This has led to an uncanny situation of the administrative side of the Court enjoying immunity from disclosure on account of delay by the judicial side. It is reliably learnt that several RTI applications filed in SC were dismissed citing the pendency of the appeals. The matter is of fundamental importance, as noted by the DB while referring the matter, and its long pendency does not augur well for the credibility and transparency of the institution. It is now upon CJI Gogoi, who had acknowledged the long pendency of the matter in 2016 itself while heading the three-member bench, to constitute a constitution bench to decide whether the SC should stall the march of RTI Act to its closed chambers.